Cindy has many years experience as an ordained minister in the Baptist tradition. She received her Master of Divinity Degree at Southern Baptist Theological Seminary in Louisville in 1985, and was ordained at highland Park Baptist church in Waco, Texas in 1987, where she was an associate pastor and youth minister. She served at the First United Methodist Church in Georgetown, Texas from 1988 to 1992, and was Director of Christian Education at Georgetown Presbyterian Church in Washington, D.C. from 1992 to 1994. She was a Baptist Chaplain to George Washington University and American University from 1993-1994, and was Pastor of Chevy Chase Baptist Church and then Broadneck Baptist Church in Annapolis, before becoming Assistant to the Rector at St. Peter's Episcopal Church in Poolesville from 1999 to 2006. There she worked in Christian Formation programs with children and their parents. Cindy was drawn to the Episcopal Church because of our rich liturgical worship tradition. She entered the discernment process leading to ordination in the Episcopal Church and attended Virginia Seminary from 2004 to 2005, where she received a Postgraduate Anglican Studies diploma. She was ordained a deacon in June 2007, and ordained to the priesthood at Washington Cathedral in January 2008. 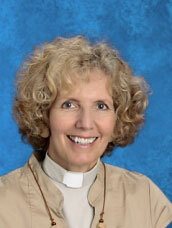 Cindy's work at Christ Church complements her part-time chaplaincy at Christ Episcopal School. She participates in our Sunday worship life, and has staff oversight of Adult Christian Formation, Welcoming, Fellowship, Pastoral Care and Communications ministries. She also provides pastoral care for our parishioners.